Apple Inc. is ratcheting up its engineering and design efforts to become self-sufficient in chips, aiming to cut costs and protect its trade secrets. Evidence is mounting that Apple is developing a 5G modem for its iPhone and other hardware with the expansion of operations in San Diego and job postings looking for cellular modem architects and wireless engineers in the area. Apple declined to comment for this article. With a homegrown cellular modem, Apple would get control of designing key parts that comprise the guts of the iPhone, including the graphics processor, central processing unit and neural engine. It would be the most challenging chip design effort undertaken by Apple since it developed the A4 processor for the first iPad and the iPhone 4, analysts said. Both of those devices were released in 2010. Apple's growing chip development efforts are aimed at owning the entire device experience, from the hardware to the iOS software, said Linley Gwennap, president of The Linley Group, a research and consultancy firm focused on the semiconductor industry. 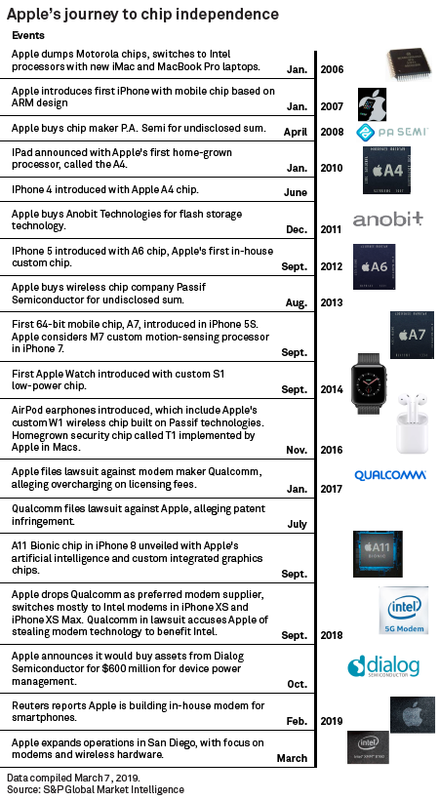 In-house chip design has been integral to Apple's strategy of being ahead of the technology curve. Apple prefers to tightly hold its trade secrets, and in-house development would also protect the company from delays or technological issues with chips from generic suppliers. "That's the advantage to Apple — they know their own products, know where products are going and are in touch with what their customers want. They can use that information from product planning to decide what they want in their chips," Gwennap said. 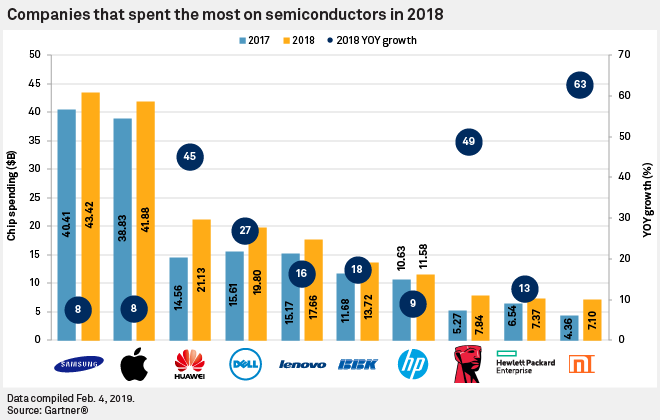 Apple is the world's second-largest semiconductor buyer behind Samsung Group, according to Gartner, and more of Apple's purchases are custom chips. Apple's internal iPhone chip development gained steam after it picked up P.A. Semi in 2008. In 2013, Apple bought Passif Semiconductor, which provided wireless technology used in the AirPods earphones. Apple is sitting on a pile of cash, and it makes sense to invest in critical hardware technologies like a 5G modem, said Benjamin Dunbar, an investment group leader who specializes in tech at Gerber Kawasaki Wealth & Investment Management. Although chip development will not generate revenue, it impacts the capabilities and sales of devices, which affects long-term cash flow, Dunbar said. "They're paying out over a billion [dollars] a year now just with licensing deals and so on. Apple has a couple hundred billion [dollars] to spend," Dunbar said. Apple has spent billions of dollars acquiring cellular modems from Qualcomm Inc., and disputes about pricing and other matters led to legal battles between the companies. Apple has switched to Intel Corp. as a modem supplier for its most recent iPhones. Apple tried to acquire a 5G modem for 2019 iPhones from Intel, but scrapped the plan due to overheating issues with the available technology, The Linley Group's Gwennap said. That also delayed the release of Apple's first 5G phone, which is now expected in 2020. Rivals like Samsung have already announced 5G devices that will hit the market sooner. While the delay marked a stumble for Apple, it also served as another motivator to develop a modem in-house, Gwennap said. A 5G modem is a complex part that will cost billions of dollars to develop, but that cost can be amortized over time considering volume shipments of the iPhone and other Apple devices, said Jim McGregor, principal analyst at Tirias Research, a technology-focused firm. "The modem is huge. It's something they stayed away from to their detriment. It is a huge differentiator. The wireless connectivity has become a critical component to competition; you have to have it," McGregor said. Some of Apple's chip achievements to date include being the first to reach 64-bit in mobile chips with the A7 chip in the iPhone 5S, developing the S-series of processors for the Apple Watch, and creating custom graphics processors. Apple's recent neural chip in new iPhones, which helps with faster face recognition and image enhancements, could be a key component in the company's pursuit of augmented reality hardware, analysts said. A recent slowdown in iPhone shipments and upgrades will not cool off Apple's chip development efforts, as the company needs to be ready for the next big iPhone upgrade cycle, said Arif Karim, a senior investment analyst at Ensemble Capital who specialize in tech. "When you slow down chip designs, you could lose one to two generations to your product," Karim said. Multiple reports, including a 2018 article by Bloomberg News citing inside sources, suggest Apple is designing an ARM-based processor for its Macs, which use Intel processors. Custom chip development for Macs is harder to justify from a cost standpoint because of low device shipment volumes, analysts said. For cost and scale reasons, Apple will continue to rely on contract manufacturers such as Taiwan Semiconductor Manufacturing Co. Ltd. to make their custom-designed chips.